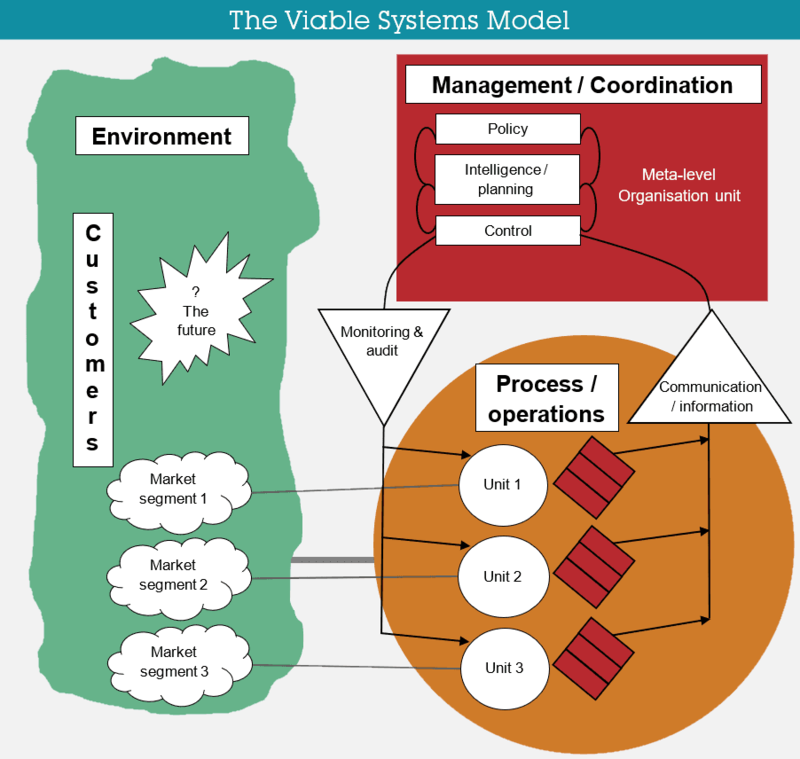 What is the Viable Systems Model (VSM)? Stafford Beer devised, applied and refined the Viable Systems Model (VSM) over a period of 30 years. It is aimed at the diagnosis and design of organisations as autonomous systems capable of self-organisation and adaptation to changing contexts. The VSM, rooted in a Cybernetics (regulation theory) approach, offers a framework for gaining vital information on a system’s functioning and ensuring its viability through requisite variety. It promotes the appropriateness and the repertoire of the system’s responses to challenges by striving to make the responses as nuanced as the problems themselves. Beer described the VSM as an insight machine rather than a technocratic solution to problems. Others have described the VSM as a paradigm shifter because of its indisputable validity and practical utility. Although his theory and the implementation of it are complex, the VSM nevertheless provides a framework according to which non-mathematicians can understand systems functioning. This review provides a brief summary of Beer’s work and main ideas but does not cover the theoretical subtleties and nuances in detail. To gain a more complete understanding of the VSM it is best to read some of Beer’s own publications such as his books, The Brain of the Firm and The Heart of Enterprise. The VSM stems from a transdisciplinary Cybernetics perspective which can be described as the science of effective organisation through communication and control, or the regulation of systems to ensure their sustainability. The epistemology of Beer’s approach is informed by Relativity Theory and Hegel’s Axiom of Internal Relations. According to Beer, all organising and management activities are aimed at dealing with complexity. He describes the measure of complexity as that of variety or the number of possible states of a system. The variety of a system also depends on the context in which it is embedded. Variety grows rapidly and exponentially with increased systems complexity. Real world systems thus show variety that is mathematically infinite. Appropriate responses to the complexity involved depends on the attenuation of the variety, or how it is filtered or amplified. Here, Beer incorporates the principles of Ashby’s Law of Requisite Variety according to which the capacity to control depends on the equilibration of the varieties of the controller with that of the system being controlled. As suggested by the naming of his book, The Brain of the Firm (1972), Beer created the VSM to mimic the structure of the human brain. The brain, with its estimated ten billion neurons, each of which has thousands of interconnections, shows astounding variety. The information picked up through our senses is also tremendously complex and varied. However, due to human system limits and social conditioning, the variety from the environment is, however, filtered or screened out (attenuated) by perceptual processes. Without such filtering the brain will be overwhelmed. The VSM also leverages measures of variety to align systems components and to match people, machines and money to jobs. Beer refers to ignorance as the most lethal attenuator. Systems, such as companies, which filter out important information (variety) about their environments, are also bound to fail due to their ignorance of new trends, new technologies and new competitors. To ensure the purposeful adaptation of a system, variety needs to be attenuated but it is the way in which this is done through filtering and / or amplification which is important. Design initiatives are therefore required to optimise attenuation processes. Various systems overlap and dynamically interact with one another. This embeddedness of systems, Beer refers to as the principle or theorem of recursion. Viable systems have a recursive structure in that all viable systems contain, and are contained by, other viable systems. Continuous adaptation of these systems is required and the term autopoiesis refers to the capacity of a system to recreate itself but maintain its identity and purpose. The interaction between systems needs to be regulated or coordinated from a meta-level to prevent conflict. Just as pain and pleasure guide responses in the brain, Algedonic alerts, or alarms and rewards, regulate purposive (which means “done with purpose”) systems recursion. Regulation aimed at effective interaction between systems, requires maximum flexibility and freedom. Beer points out that rigid systems offer reductionist solutions to complex contextual challenges. Company organograms, for example, represent inflexible structures which largely fail to accommodate the dynamics of systems functioning. The VSM offers the concept of self-organisation to overcome the challenges of rigid or inappropriate organisation. In nature, systems are characterised by self-organisation. In social systems optimal self-organisation occurs when the freedom of participants is maximised within the restrictions necessary for the system to fulfil its purpose. According to Hilder (1995), self-organising systems have a hierarchy of purposes. A lack of purpose signifies the collapse of a system. Design aimed at the maintenance and adaptation of systems, focuses on the relationships between the components within a system as opposed to the components themselves. In other words, how information flows between system components is much more important than the individual components. The environment refers to the domain of action of the system, which contextualises the interactions of the organisation. The first three levels or subsystems are focused on internal operational functions in the shorter term (here-and-now). Included are primary activities, communication channels and control structures. System 1 refers to the fundamental operations and management of the implementation process. The environments of operations may overlap and interfere with one another and must be coordinated to reduce oscillations and disruptions. System 2 involves the (often informal) coordination of System 1 elements (through timetables or production plans). System 2 management of System 1 normally dictates operations because senior management does not have the requisite variety to do so. In other words, senior management is too far removed from the daily problems to be able to fully understand and help solve them. System 3 involves the control of the internal and immediate activities of System 1 as well as the supervision of System 2. The fourth level or subsystem is responsible for integrating internal and external factors aimed at balancing the current situation with the demands of the broader context in the future (there-and-then). System 4 is referred to as the intelligence function aimed at ensuring adaptation to changing external circumstances. It requires channels to the environment and rich interaction with System 3. The intelligence of System 4 does not operate in a vacuum, though, it stems from the ethos, nature and character of System 5. The fifth level or subsystem balances the short-term internal functioning (here-and-now) with the long-term internal and external contexts (there-and-then). It includes decisions to direct the entire organisation to ensure its sustainability. System 5 defines the ethos or the identity of the organisation and manages Systems 3 and 4. It is the basis of policy as well as the organisation’s unwritten constitution. The functioning described above applies to all viable systems, including those that are natural as well as man-made as both these systems rely on adaptation to changing environments for their survival over time. Compared to the architecture of the brain and nervous system, Systems 3, 2 and 1 of the VSM reflect the autonomic nervous system. System 4 represents reasoning and communication whereas System 5 replicates introspection and decision making. Beer’s four principles of organisation specify the primary sources of certain outcomes. In describing the functioning of these systems, Beer capitalises on Ashby’s Law of Requisite Variety which specifies that control is only possible if the variety of the controller is equal to, or greater than, the variety of what is being controlled. This notion forms the basis of Beer’s first principle of organisation, namely that Environmental, Operational and Management varieties should be designed to equate, but with minimal costs and damage to people. In other words, different varieties characterise the Environment, the Process and the Management of the Process. The variety of the Management system is, however, less than that of the Process system and requires amplification to match the requirements of the Processes or operations. This can, for example, be achieved through performance contracts and policies. The variety characterising the Process system also needs amplification to match that of the Environment – through advertisement, for instance. The potentially infinite variety posed by the Environment, however, needs to be filtered or attenuated through market research, for example, to optimise Operations in the environment, in the same way that Process variety has to be filtered for Management purposes through progress reports and accountability measures. The variety of the various interacting subsystems thus need to be designed and controlled to match one another to ensure the homeostasis and equilibrium of the broader systems. The communication channels involved in these processes, also need requisite variety for the effective transmission of messages. Should the systems not be able to accommodate one another’s variety, the systems will become unstable and collapse. 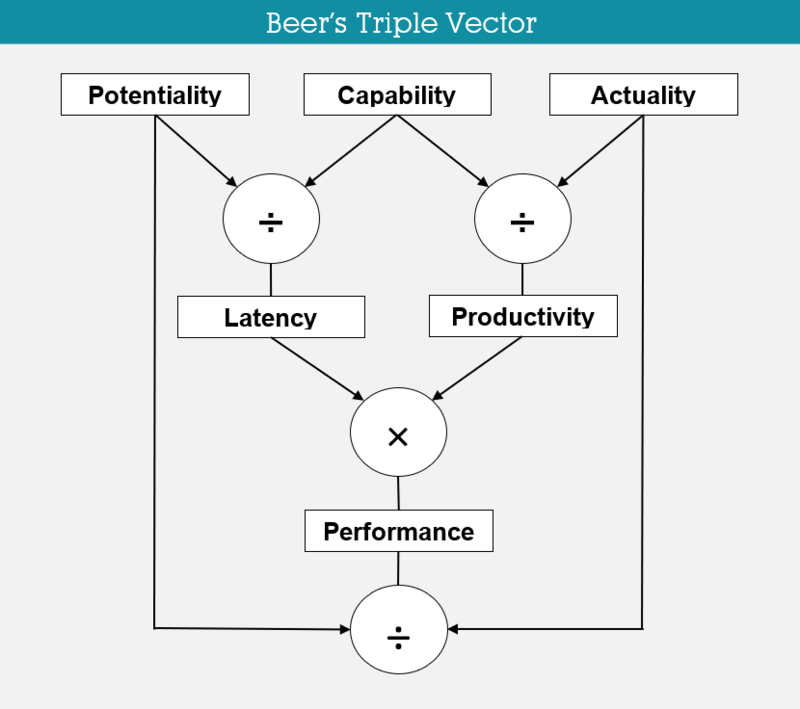 Beer’s second principle of organisation states that the four channels carrying information between the three systems, should have a higher capacity to transmit information at the time of messaging than the originating system which generates the message. The time factor is thus important as the stability of a dynamic system depends on timing. His third principle of organisation refers to the crossing of the boundaries between a channel and a system at which point transduction, or translation of the message, or energy conversion from one form to another, takes place. Here the variety of the transducer must be equivalent to the variety of the channel. The effectiveness by which messages are transduced or translated, is a critical factor in systems functioning. The fourth principle of organisation stipulates that the first three principles are to be cyclically maintained without time lags or delays. In other words, the speed of communication and responses are to keep up with changes that affect the system. Other systems theories of organisational design also emphasise the critical impact of time delays. These six functions allow viable systems such as living organisms and organisations, to control the flow of materials, energy and information that comes from the environment. Every line of communication between a system and its regulator represents a homeostatic circuit or exchange system. The attenuation processes of amplification and filtering are required to navigate recursively upwards and downwards within any viable system regardless of its size. the Law of Cohesion for multiple recursions of viable systems refers to the balancing or equating of the System 1 variety which is accessible to System 3 of recursion, with the variety disposed by the sum of the metasystems of recursion for every recursive pair. The VSM concept of variety is also used to match people, machines and money to jobs that produce products or services. Jobs can be performed by one or many people. One person can also perform many jobs. A specific job may require of a person to shift focus between internal and external systems 1 to 5. The type of decisions made and the effort (and cost) involved, determines the resources, hence the variety, of a job. The VSM model offers a framework for gaining vital information on systems functioning, aimed at ensuring the requisite variety, or viability, of systems. It uses variety measures to enable the system’s repertoire of responses to challenges, to be as nuanced as the problems themselves. Regardless of its valuable contribution, Beer’s VSM is not widely known. The VSM is, however, applied to analyse and understand organisational structures and structural relationships; to diagnose organisational problems and to guide business process engineering. It is applied in the military, government administration, virtual communities, higher educational institutions, as well as in the fields of engineering, web technologies, collaborative and service networks, supply chains, health and safety systems, etc. This blog is part of a series on models of work complexity, which includes “What is the Information Processing Model (IPM)?”, “What is the Stratified Systems Theory (SST)?” and “Models of Work Complexity: a comparison of the IPM, SST and VSM”. Beer, S. (1972). Brain of the Firm. Allen Lane, Penguin Press, London, Herder and Herder, USA. Beer, S. (1979). The Heart of Enterprise. New York, NY: Wiley. Beer, S. (1984). The Viable System Model: Its provenance, development, methodology and pathology. The Journal of the Operational Research Society. 35 (1): 7–25. doi:10.2307/2581927. Beer, S. (1994). Diagnosing the System for Organizations. New York, NY: Wiley.